KROTOA has already won eight coveted awards, including an Award of Excellence at the International Film Festival for Women, Social Issues and Zero Discrimination; a Best of Show at the Depth of Field International Film Festival; a Platinum Award at the International Movie Awards; a Diamond Award at the Filmmakers World Festival; a Best of Show at the IndieFEST Film Awards; an Award of Excellence Special Mention: Women Filmmakers at the Accolade Global Film Competition; a World Platinum Award at the World Woman Awards and an award for Best Film at the Harlem International Film Festival held in New York. The movie has also received six official selections at international film festivals around the globe and was also included in the prestigious Female Eye Festival, which focuses on female filmmakers and stories about women. The film, written by Kaye Ann Williams and Margaret Goldsmid, was created by a dynamic team of women, with acclaimed filmmaker Roberta Durrant as director and producer. Roberta is the creator of various award-winning South African television series and sitcoms, as well as the children’s film, Felix, which won seventeen international film awards. KROTOA is inspired by real-life historical events. The scriptwriter tried to stay true to facts and deductions made about her life, having first made a documentary about KROTOA’s life with the help of various historians and cultural advisors like Dr. Yvette Abrahams, Prof Jatti Bredenkamp, Dr. Vertrees Malherbe and Ron Martin. The narrative feature film script is inspired by historical facts and deductions made about her life. 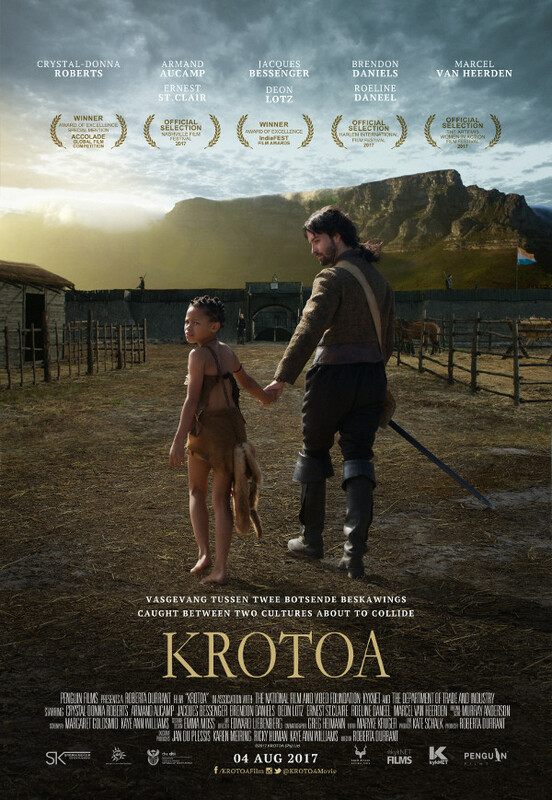 Bradley van Sitters and Dorothea Davids advised in terms of the Khoisan language, Khoekhoegowab, which is one of the languages spoken in the film along with Afrikaans. “KROTOA’s story was created by a crew of dynamic women. It was imperative that her story not only be told by creatives from the community, but also from a female perspective. This feature film is the culmination of three years of research, scripting and, most importantly, actively engaging with top historians on the subject. Because of the importance of the story the film enjoyed the support and endorsement of The National Film and Video Foundation (NFVF), in association with M-Net and the Department of Trade and Industry (DTI). Every effort was made to honour this heroin’s life and memory,” says Kaye Ann Williams, who created the script for the film as a result of a documentary she produced and directed on KROTOA’s life. “In comparison to men, very few women have been acknowledged for having an impact on South African history. KROTOA (Eva) is the tragic heroin of this movie. It is not only important to tell her story because of all her great achievements, but it is also necessary to highlight that she was caught between two ways of life and constantly forced to choose between these two cultures. Identity, a sense of belonging and reconciliation are strong, universal themes in this powerful tale. Especially because the identity of someone, who is in between two cultures, is very relevant in any multicultural society,” Durrant adds. Crystal-Donna Roberts, known for movies such as Endless River, Die Ongelooflike Avonture van Hanna Hoekom and Skeem; as well as television series like 7de Laan, Montana, Vallei van die Sluiers, Getroud met Rugby, Boland Moorde and Byl, plays KROTOA, while SAFTA acclaimed actor, Armand Aucamp – who is renowned for his work in Ballade vir ’n Enkeling and Die Boekklub – portrays the role of Jan van Riebeeck. Jacques Bessenger, Doen Lotz, Marcel van Heerden, Roeline Daneel, Brendon Daniels and Ernest St Clair also star in this critically acclaimed film. Sy word na die eerste Fort geneem, wat in 1652 deur die Oos-Indiese Kompanjie gevestig is. Hier word sy groot as ’n visionêre jong dame, wat die Nederlandse taal en kultuur so goed verstaan, dat sy ’n invloedryke tolk word vir van Riebeeck – die eerste goewerneur van die Kaapkolonie. Krotoa word egter op die ou einde deur haar eie Khoi-mense verwerp en deur die Hollanders vernietig wanneer sy probeer om ’n middeweg tussen die twee kulture te vind. KROTOA is a striking tale about a woman, who was prepared to sacrifice everything, to give birth to the great nation we all share today. It not only has a powerful message, which anyone can relate to, but also promises to take moviegoers on an epic adventure back in time.